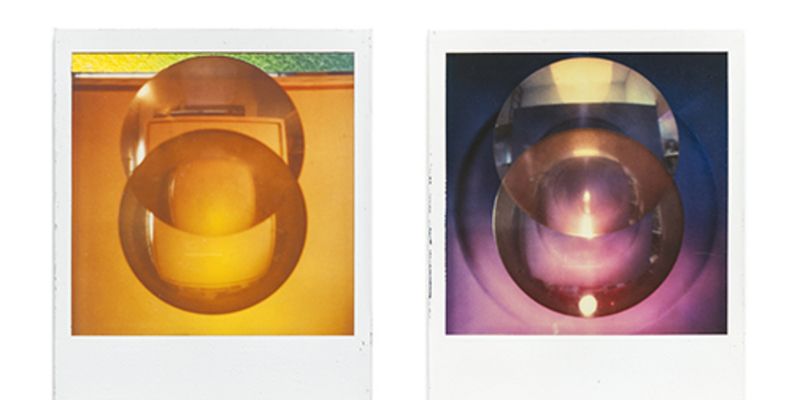 Hon Chi-fun, Untitled 04, 13, 14, 05, 1983, Polaroids, 4 x 3”. Hon Chi-fun (1922–2019), a self-taught artist, began making plein air landscapes in oil while working for the Hong Kong post office in the 1950s. In 1964, he cofounded the avant-garde Circle Art Group, which, through the abstraction of traditional Chinese aesthetics, innovated a cosmopolitan modernism. One of the earliest works in “A Story of Light,” a selective, four-decade survey, is the Pop art–inspired Bath of Fire, 1968. For this silk-screened acrylic work, Hon imprinted a delicate frieze of maps, photographs, personal letters, and poems—all indistinct, like oxidation or mold—into a triptych of flat red and green circles. The artist described the work as a rebirth. Brought to New York by a John D. Rockefeller III Fund grant in 1969 and enamored by the city’s nascent graffiti culture, Hon started experimenting with airbrushes to apply acrylic to canvas and continued to investigate the circle, a sacred symbol within Zen Buddhism, as a compositional form. The results are profound, like a soul at rest. In Up and Away, 1974, a globule hangs like a moon in an atmosphere of gradient blue—the work has the sensitivity of Geoffrey Hendricks’s sky paintings. If “A Story of Light” contends that light, as much as line, is a foundational material of representation, it is also, significantly, a study of lightness. The philosophic density of this idea lends the paradox that makes these paintings glow. Two small grids of untitled Polaroids from 1983 see the artist filter the luminescent spirituality of his paintings into the photographic process—they are made through direct interventions upon the surface of the film. Nil and Void, 1996, is likewise unorthodox. In this work, Hon’s signature circle motif is infused with a cloud of fat, sticky strokes that evoke the swiftness of ink-and-brush painting and the gummy splats of Abstract Expressionism. Encapsulating the artist’s inquisitive and lifelong fusing of approaches and impressions, this painting, like the exhibition, embraces incompleteness. It is a story of departures as well as continuities, in which Hon affirms that plurality thrives when differences are deconstructed, not resolved.